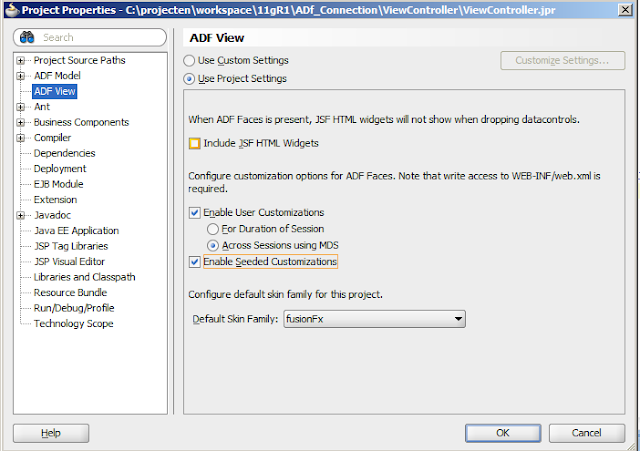 With Patch Set 5 of Fusion Middleware you can finally change your ADF connections ( like a Web Service connection ) in the Enterprise Manager Web Application. So you can make one application deployment and deploy it to acceptance and production. In many cases ADF and JDeveloper automatically creates connections ( like a ADF WS DataControl ) which could not be changed after deployment, you need to do this before deployment or change the EAR. 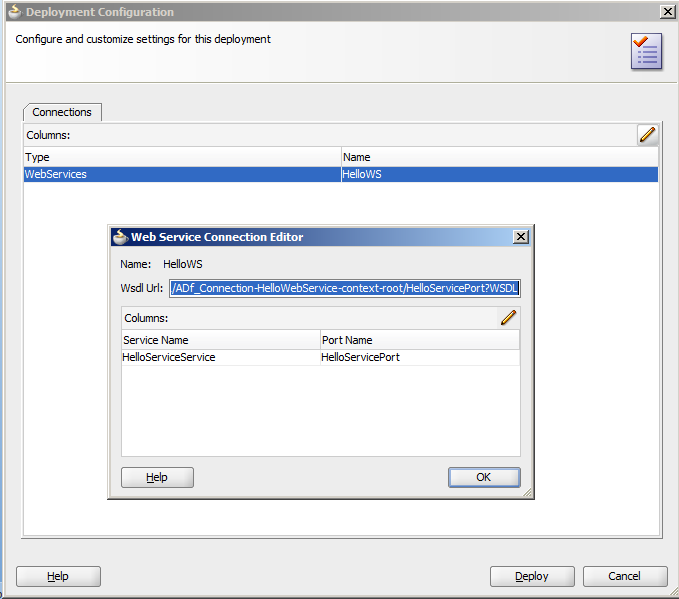 With PS5 you can change these connections in the "Configure ADF Connections" menu option on the application deployment ( EM ). This is also possible with WLST where you can change and persist the attributes of the application connection MBean. Have a WebLogic domain which has a configured MDS repository. Add some listeners to the web.xml ( for the MBean support). 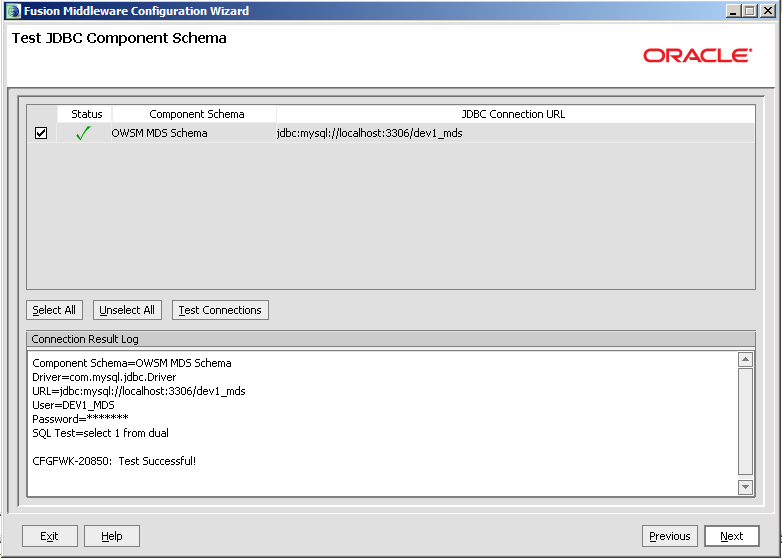 Enable MDS ( else the connection details won't be persisted ). Add an ADF Connection on the Web Service entry when you use a Web Service Proxy. 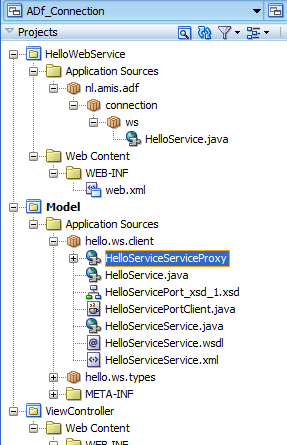 In this blogpost I will show you the steps how to make this work and change in this example the endpoint of a web service. 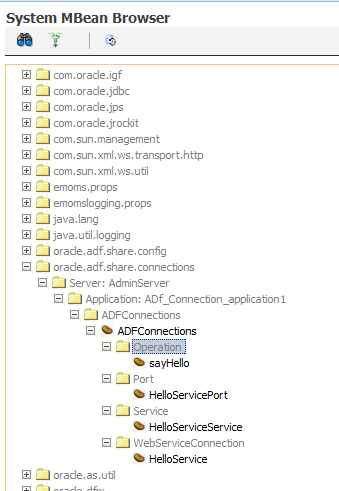 We start for example by adding an ADF WS DataControl. 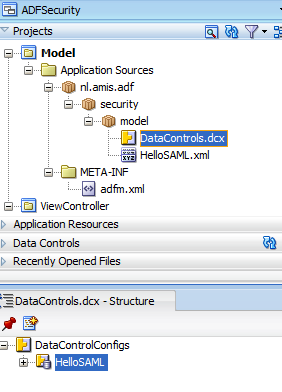 This will always add a ws connection to the connection.xml file in the ADF META-INF Folder. 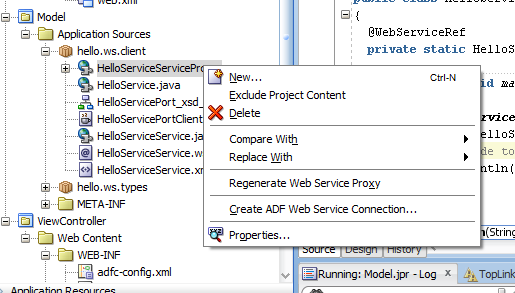 This is also possible on a Web Service Proxy when you don't use an ADF WS DataControl. 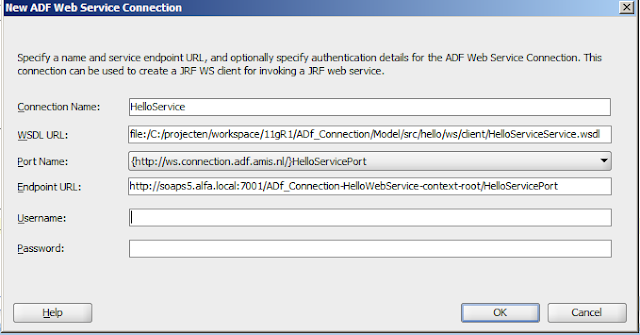 Select the service and right click on Create ADF Web Service Connection. Use the service and finish your Application. 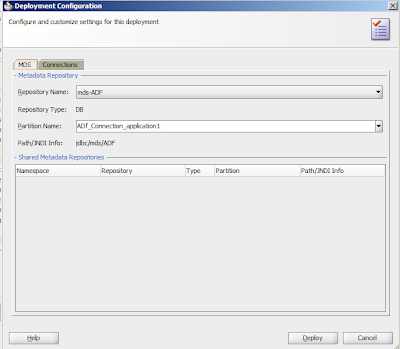 Prepare your Application for allowing to change your ADF Connections. 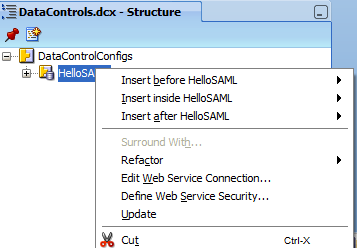 First we need to add the ADFConnectionLifeCycleCallBack and the ADFConfigLifeCycleCallBack listeners to the web.xml. 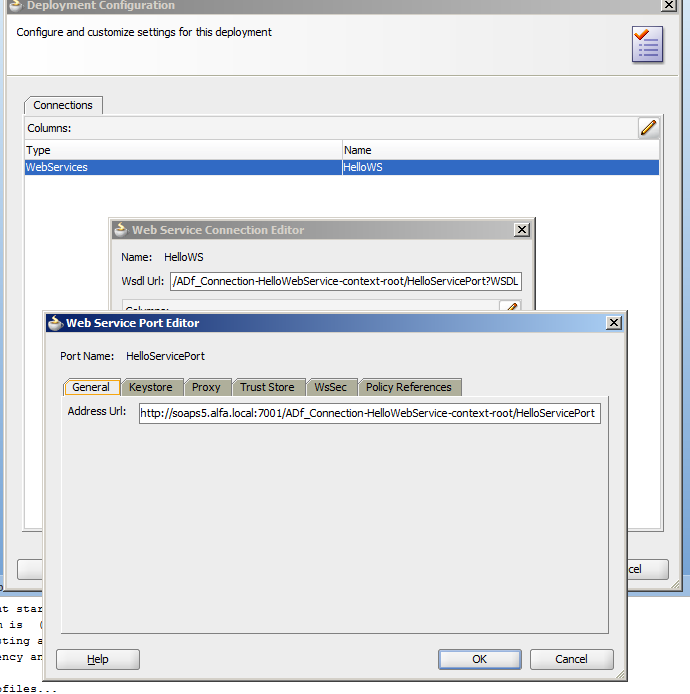 This enables the ADF Connection Mbean support. 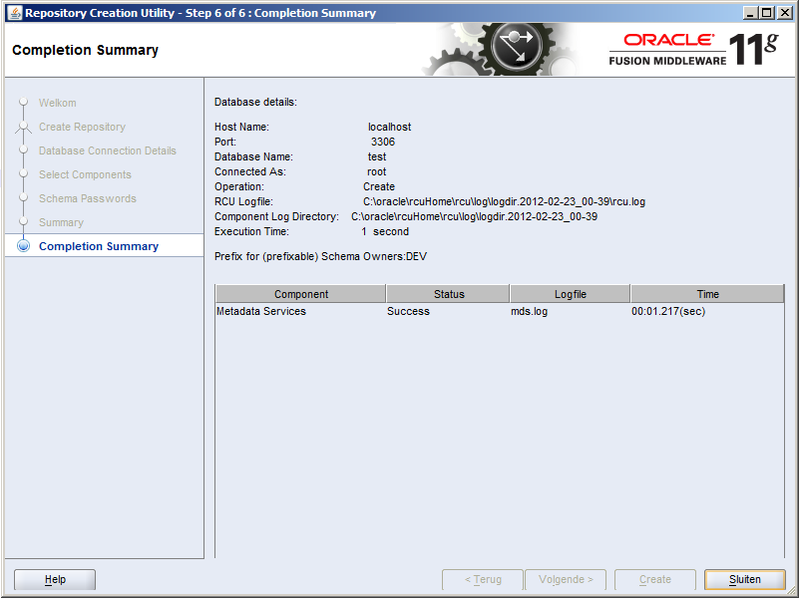 Enable User Customizations ( across sessions using MDS ) and Enable Seeded Customizations. We are ready to deploy our application. 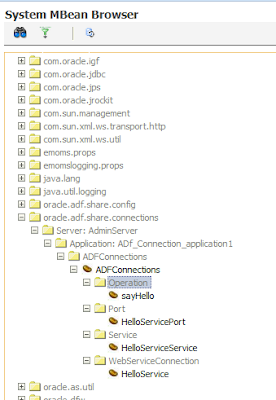 You should see the MDS and Connections Tabs when you deploy from JDeveloper. Optional look at the connections. After deployment we change the WSDL URL and endpoint in the Enterprise Manager. First select your application deployment. Here we can see our connection. Because we enabled MDS on the application we can change the connection else you won't see the Edit , Delete buttons. 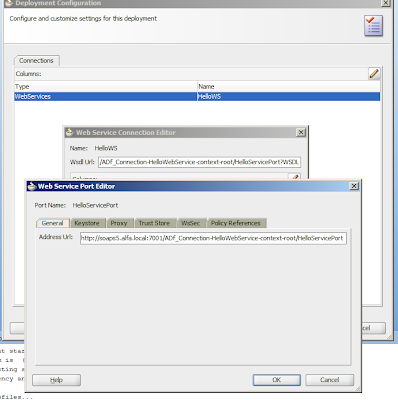 Change the WSDL URL by clicking on the Edit button. Click on OK and apply the changes. The new URL is stored in the MDS repository. 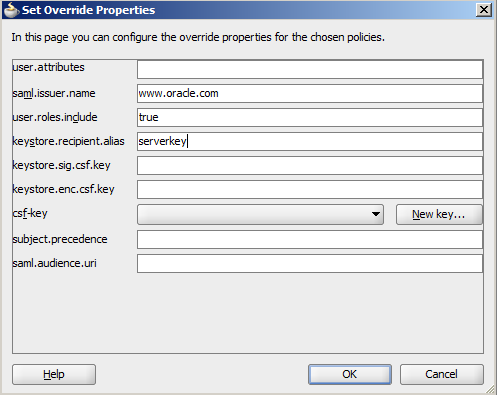 Also click on Advanced Connection Configuration where we also need to change the endpoint address and click on Apply. We are ready to test the application with the new WSDL url and endpoint. 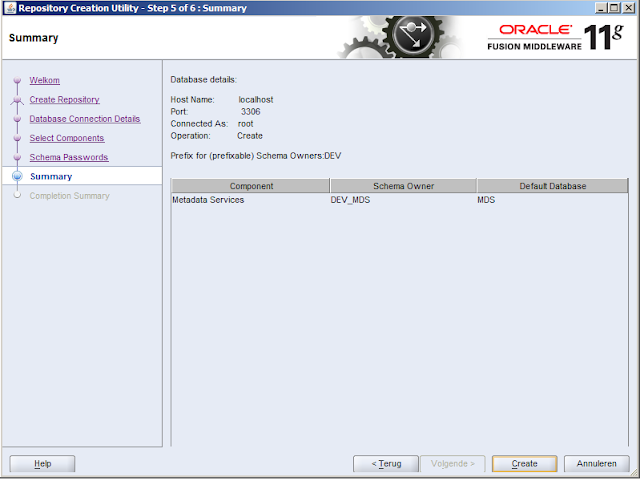 One of the new features of Fusion Middleware 11G R1 PatchSet 5 (PS5) is the support for MySQL 5.5 as Meta Data Services (MDS) repository. 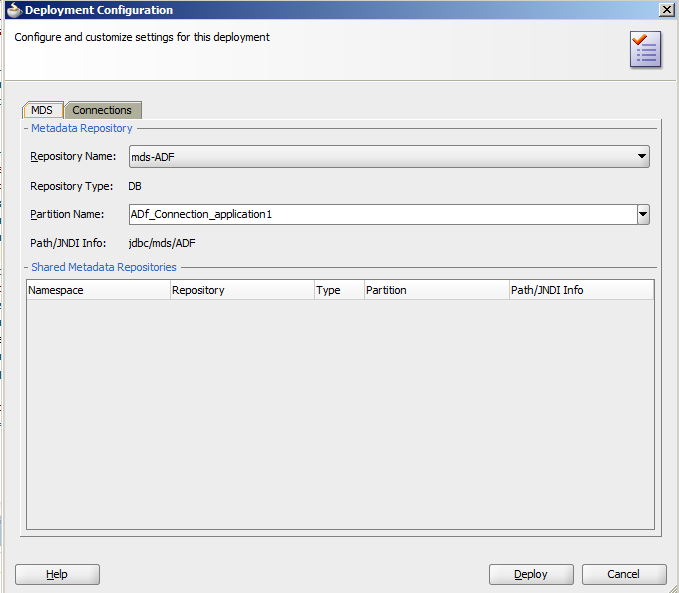 This means you can use MySQL database as a store for ADF personifications or as policies store for your OWSM domain. 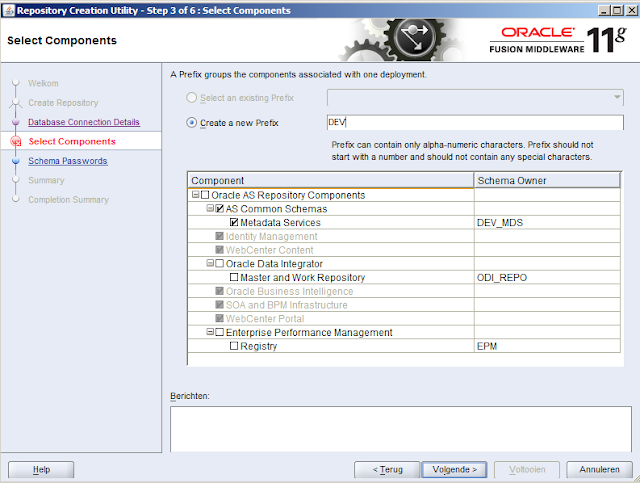 For MDS you just need a small database which store these configurations. For the SOA infra repository ( not supported on MySQL ) I think the Oracle Database will always be the best choice ( tuning, transactions, RAC ). This way you add the MySQL database on the same machine as your WebLogic Domain without taking a lot of machine resources, less maintenance or thinking about licensing costs. In this blogpost I will show you the steps how to create a MDS repository for OWSM and ADF. First we start with downloading MySQL 5.5 and install it on a machine. I will use InnoDb as database engine and UTF8 as character set ( this is probably best tested by Oracle). 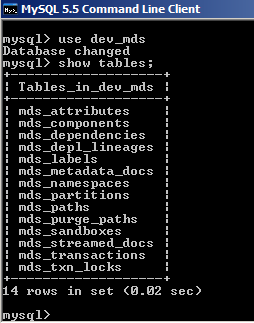 Add or change the following database settings in the my.cnf of the MySQL database. The sql-mode is necessary in OWSM else you will get a SQL error ( escape ' \' on a like ) when you start the WebLogic Domain. Start the RCU installer and select MySQL Database as database type. I will use root as username cause it needs to create a table ( schema_version_registry) in the test database and it wants to create a new database. MySQL does not support all options but for us, the Metadata Services option is enough. Besides MDS, MySQL is also supports ODI ( Oracle Data Integrator ) and Enterprise Performance Management, I personally don't know these products so I can't test them for you . 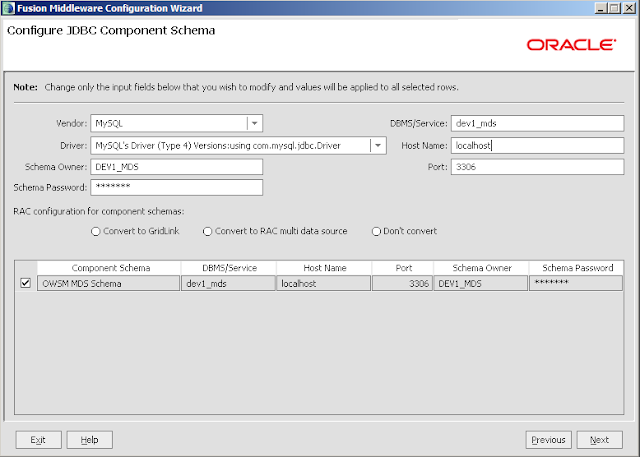 RCU creates a dev_mds database and an user dev_mds user. 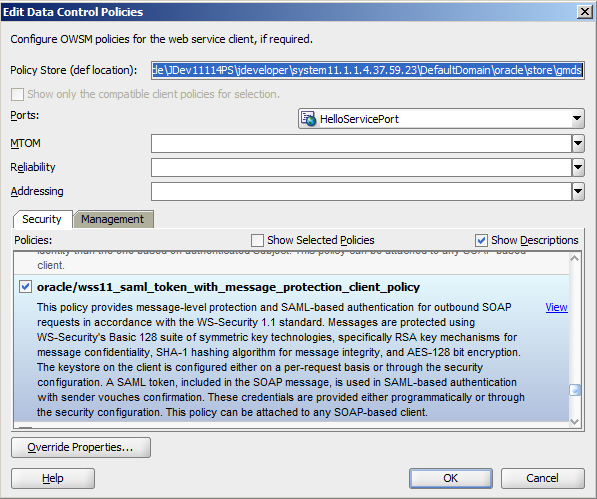 Now we can start the OWSM WebLogic domain and deploy our protected Web Services. 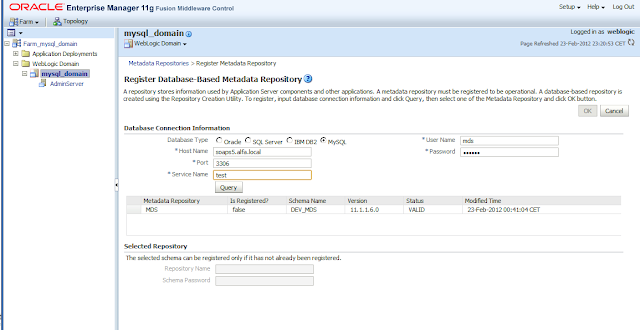 We can also use it in ADF, for this we need to open the Enterprise Manager application, select your domain and go to Metadata Repositories. Click on Register. I create a new MySQL user which has access to the test and dev_mds database. 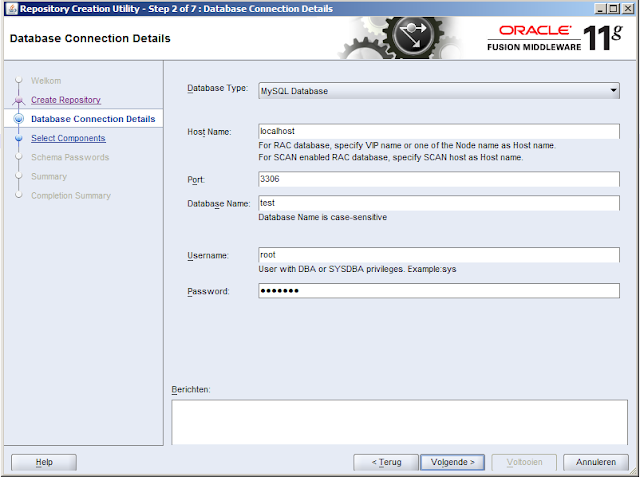 the test database contains the RCU schema_version_registry table which contains all the entries. use mds as username and test as service name. Now you can register you own MDS database repository. 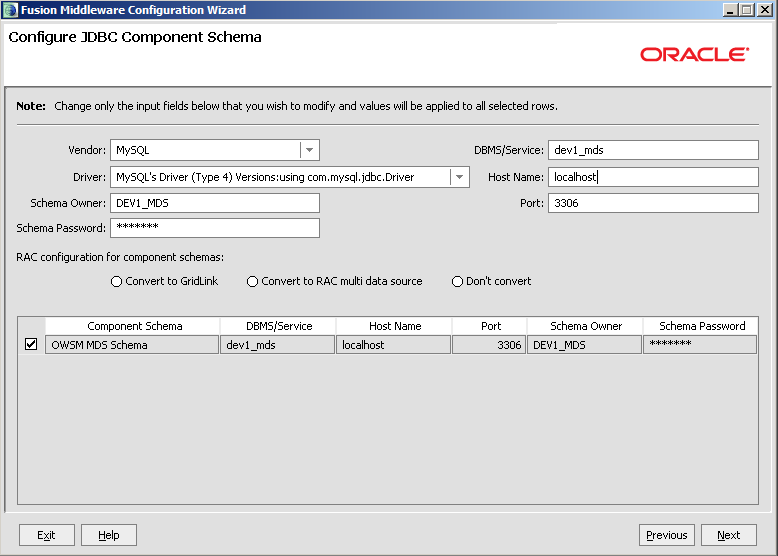 When you use a JCA adapter in Oracle SOA Suite or OSB then you know that you need to configure a plan of some WebLogic Resource Adapter. With this ANT script I tried to make this an easy task for you and which you can repeat on different WebLogic Domains. This ANT script can easily add multiple EIS entries to the following adapters: DbAdapter, AqAdapter and JmsAdapter in just one run. After these changes to the resource plans this script will redeploy only the changed Resource Adapter. Special thanks for my colleague Michel Schildmeijer for inspiring me to make this flexible script and off course for the necessary WLST code. First you need to create a Plan for the 3 Resource Adapters (Db,Aq,Jms) and add a dummy entry, think how you name it and where you put it. When a plan is changed and you have a soa cluster or the soa weblogic instance is running on a different server then you need to copy the plan to all servers or put it on a shared storage. If you don't like this then you can always create new Resource Adapters by following this blogpost. 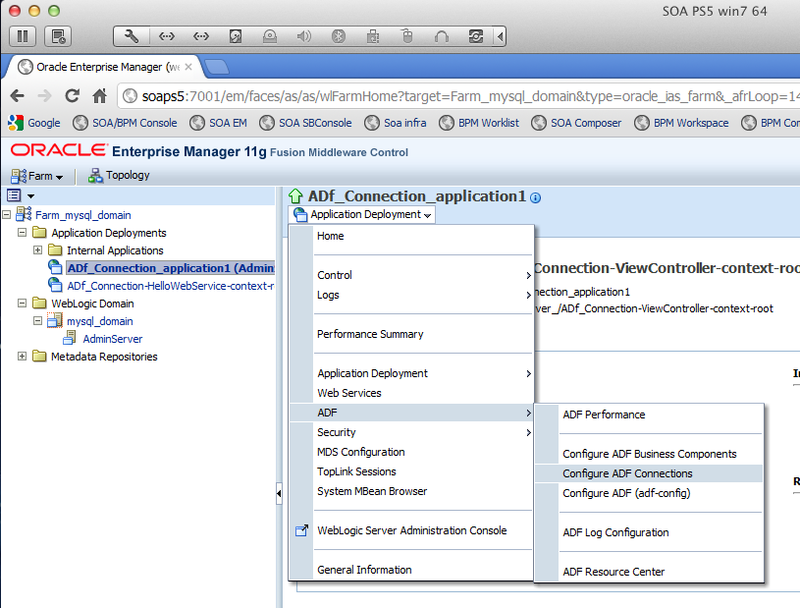 Where are the adapter rars located in your FMW domain, this can be in your SOA or OSB Home of the FMW domain. Then add your own EIS entries, these ones in this var will be added to weblogic. 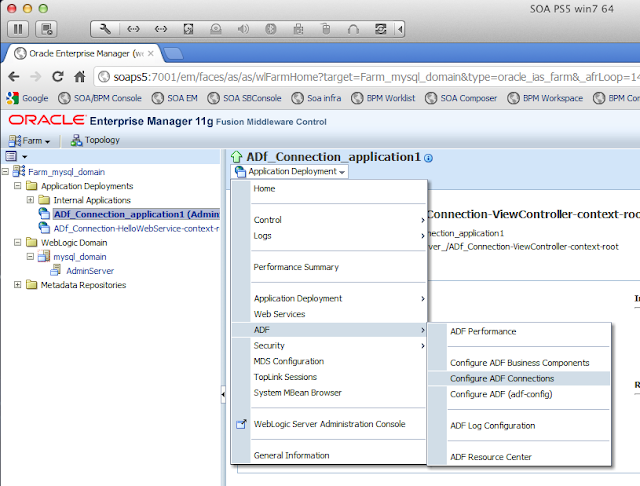 Think if you need to set the XA or Not XA datasource property or in Jms the connectionFactoryLocation.